Just got this big beautiful time piece and man is it worth every penny. The pictures do not do it justice. So far(the last 3 hours) sync between the second hand and the digital read out are right on the money. It has a really nice feel on the wrist thanks to the thick leather band (smells good too). If you are looking for a nice hybrid chronograph, look no further because this is it. Thanks Stauer for a real winner!!! I recently purchased this watch from an email special I received from Stauer. I already own a few watches from this company & being a Platinum Club member, this offer was one that I could not refuse! I agree with all the accolades that have been posted so far, but I wish to add one of my own. Although it is not stated in the description - and my sales representative could not tell me for sure - but once exposed to light, all the numerals & the hands DO glow in the dark! This feature, along with the leather band makes this one particular watch my &quot;everyday casual&quot; watch. Thank you Stauer for producing timepieces that are affordable & are good looking to boot! I just received this watch and it only took a few minutes to set it up with the digital and analog watch face. 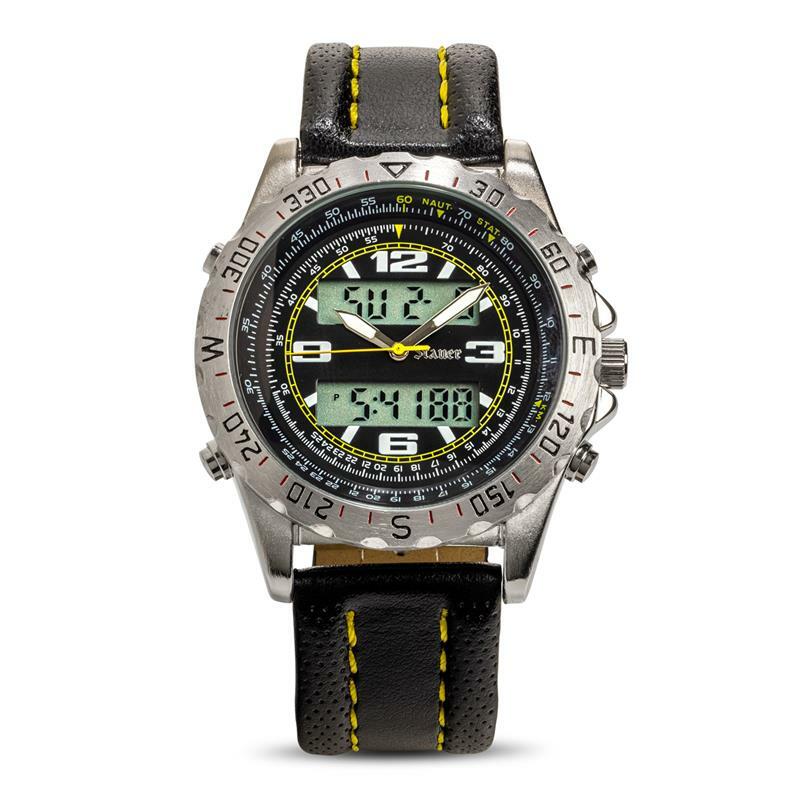 I work in the surveying and construction industry and need a rugged watch that will not be twisting and turning all over my wrist as I work. The real leather band allows me to get just the right fit for this fine watch. What amazed me was the detail on the watch face itself. Your photograph on the web page and catalog does not even come close on how great this watch looks. This is my work horse watch and I am proud to wear it. I''ve owned this watch for about a year. Still havn''t figured out how to set the hourly chime! This watch is great for not only day to day but also when dressed for special occasions. I''ve received several compliments already about its size and great appearance. The fit is very good and keeps very good time. Thanks Stauer for another great watch! This is the second watch that I own from Stauer! I received my watch on March 1st. and eagerly opened the packaging. The watch was as advertised. Impressive size. great looking dial and watch band. Adjusting the date,time,and alarm was easy due to the straightforward instructions.I also received your catalog. And as a Platinum Club member, I received 4-$50.00 discount coupons & a 20% discount coupon. I enjoyed reading about Stauer and as a 1st. time buyer, I was impressed and happy with the order process from start to finish. You have great customer reps ! Very polished and professional, reflecting the image of Stauer ! I'm looking to get the atomic watch next. Best watch ever and awesome price. Have seen the Stauer ads in magazines for years, and when I saw this watch for $59 I couldn't pass it up. Received the watch today and I am even more impressed with the actual product. The pictures do not do this time piece justice. It is a large, awesome appearing watch, looks far more expensive that the actual cost. Became a Platinum member with the purchase of this and I already am looking at other watches and jewelry for my wife. Buy the Stauer products, you won't be disappointed! Bought this watch from a magazine ad i came across at a Dr.'s appt. I love the watch. Rugged enough for everyday work, classy enough for anyplace you may go. people who notice this timepiece who have an eye think this is a 400 to 800 dollar watch. Its functionality is everything one could ask for. I also work in the surveying field and this watch fits the bill. Not just a watch but is also a tool. Very Satisfied customer. Best watch Ive ever owned. Well, I saw this watch online and instantly fell in love with it. The colors, the functionality...it just spoke to me. I couldn't wait to get it. When I did get it, the first thing I noticed was that the band seemed very cheap. As I've been wearing it the last few months, the band has started to tear from putting it through the clasp. It seems that the black of the band is some sort of coating put over the actual leather band and now it is wearing off. Every other aspect of the watch is fantastic, just wish the band was a little more durable. What a timepiece! I just received the watch in today's mail, and I was a little shocked at how HUGE it is, but that didn't matter, because it is beautiful, and I know why I ordered it :) the hybrid feature is exactly what I wanted. Thanks Stauer! ESTE RELOJ ES IDEAL , ELEGANTE COMODO SU USO Y ESTA HA UN PRECIO INCREIBLE. EL AJUSTE ES MUY BUENO Y SE MANTIENE BIEN. GRACIAS STAUER PR OTRO MAGNIFICO RELOJ. Nice watch but a bit tough to program. Looks and feels like the Perfect blend of masculinity, elegance and a solid, high quality work of engineering. Pictures don't do it justice. Love the leather band; Doesn't pull arm hair like the metal bands. Hands do not glow which I prefer. The digital lights up when you press the button. Bezel is functional. I've owned quite a few watches over the years. I like this one more than my high end citizen and seiko watches. You can where it working construction or dressed in a suit. I Love This Watch!!! This is the second watch I have bought from Stauer and am more than pleased with it. it is not a dainty watch, the watch and band are both big and heavy but that seems to be the style and when you wear this you are in style. It looks really nice and since I have had it a while it is keeping good time and holding up very well. For the price I payed you can not go wrong. Seen this in a magazine NRA . It was a lot more classy than the pic.Stauer has been great to work with .The functions are easy ,I would recommend Stauer a good company to do business with. Just received this watch a couple of days ago and I replaced the band with a stout, brushed stainless steel band. It goes very well because the watch looks like brushed stainless on the top and polished on the sides. It is a large watch so you need to be comfortable with the size but I like it. I really like having the analog/digital combo and the functionality it provides. A good-looking watch all around. This is a great looking watch and works great also. It looks and feels rugged on the wrist. I am really pleased with this watch. I have purchased a number of Stauer items and own a number of Stauer watches - love them, great value but one complaint... I purchased a Centurion Hybrid Watch - leather strap - in October, received last month (mail slowdown here). Watch strap buckle fell off this morning.. lost one of the parts so called Stauer service a moment ago asking about a replacement buckle or missing buckle part - glad to pay if necessary but I was told that since the order date was over 30 days, nothing can be done and I should talk to a local jeweller about replacing the missing part. Checked, that part not available through local jeweller so unless I take a strap from another of my watches, this watch is useless. 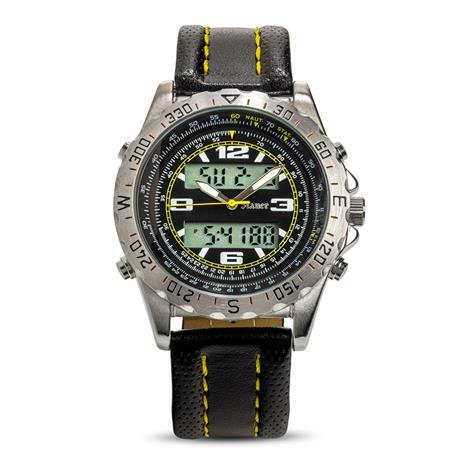 Anyone considering buying a #20409 Centurion Hybrid Watch, do check the metal buckle on the strap to make sure it is connected well and is not loose otherwise you may have a similar problem. This watch doesn't do dainty. And neither do I. Call me old-fashioned, but I want my boots to be leather, my tires to be deep-tread monsters, and my steak thick and rare. Plenty of folks around here appreciate the softer side of life. Monet, Shakespeare, whoever. They're all great, but I don't want to wear anything inspired by pastel waterlilies or a 400 year-old sonnet. Its inspiration should come from things like dirt and axes. Firefighters and belt sanders. And if you want to talk beauty, then let's discuss a 428 cubic inch V8. Things that can't help being tough because they were just born that way. That was the direction I gave our designers when I suggested a new watch. I walked into the meeting, pulled out an old toy truck (the kind you and I played with as kids: yellow and black, made of real metal, weighs as much as a sledge hammer) and said, "Turn this into a watch." They didn't disappoint. The Stauer Centurion Hybrid is ready for much more than the sandbox. This is a grown-up watch for grown-up boys who want grown-up toys. 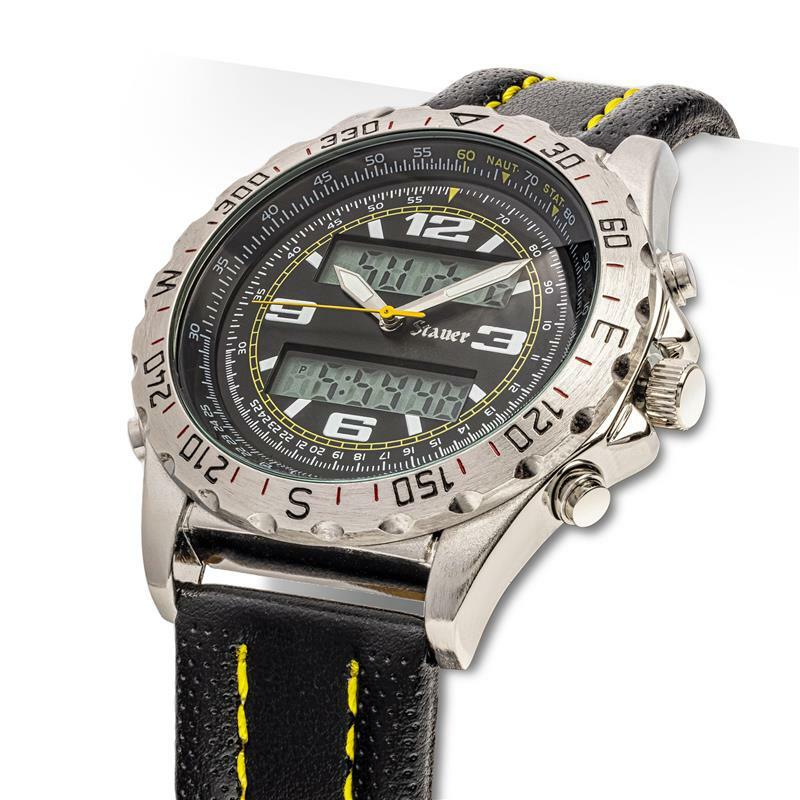 The heavy-duty alloy body is chromed and detailed with a rotating bezel that allows you to track time and speed. The luminous hour and minute hands mean you can keep working into the night. And the dual digital displays give this watch a hybrid ability. The LCD windows show the time, day and date, include a stopwatch function, and feature a green electro-luminescent backlight. The designers were sure to incorporate elements from that diecast beast of a toy I gave them for inspiration. The band is accented with yellow stitching and the dial and second hand pop with that same memorable color. So go ahead, get to work on that engine or fire up the radial arm saw. This watch can keep up. The only problem you'll have is deciding whether to keep the Stauer Centurion on your dresser with your wallet and car keys or tucked inside your toolbox. Wrist Accommodations 7 ¼” To 8 3/4"